The “tapered” gib is also trapezoidal in cross section but it tapers from side to side along its length. The tapered gib achieves a similarly rigid mechanism but in a completely different way. For it to work one side of the female dovetail also has to be tapered along its length. The taper works like a wedge that fills the space between the male and female parts. But for the dovetail to still work it is essential that when it is fitted next to the female part the edges touching the male part are parallel. Of course, the sides of the male part have to be perfectly parallel as in all other case. The taper required is such that a movement of the gib by, for example, 10mm, must result in a change of width of the order of 0.1mm. This too small to show up in a photo. The angle of the taper is not critical but the angle of the taper on the gib must exactly match the angle of the taper on the female part of the dovetail. Suppose we have already made the male part of the dovetail. In every single type of dovetail the male part is always parallel. In this case the female part is tapered on one side and with the taper on the gib produces two edges that then mean that the two sides meeting the male part are parallel. We now need to make the female part and the tapered gib. Some people might have trouble making two identical tapers of exactly 1.00mm in 100mm on two occasions. The trick is to make these two parts in one setting. The angles might not be a particular value but they will be the same which is what matters. Make the male part of the dovetail. This is exactly the same as the male parts of the previous dovetails. Prepare the female part of the dovetail by squaring it up. 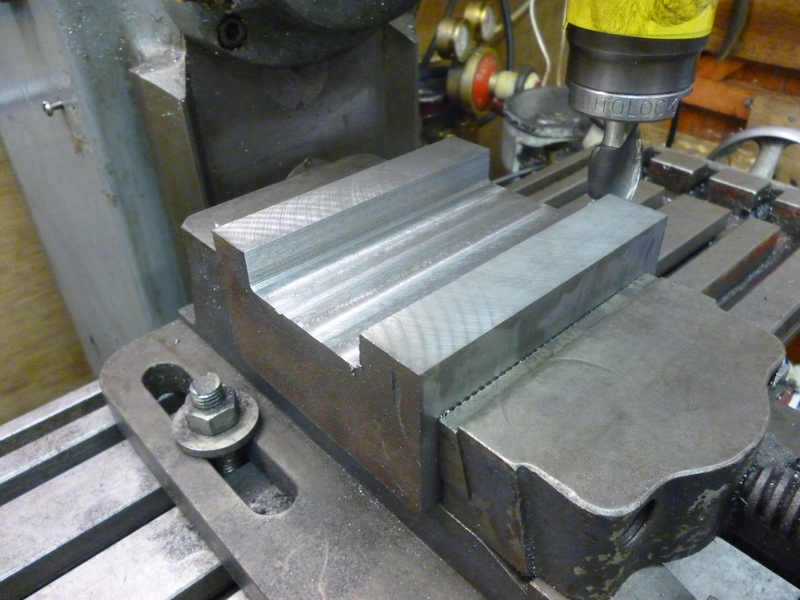 It is held in a rack vice that has been aligned to the edge of the milling table. The middle ONLY of the female part is removed with an endmill. 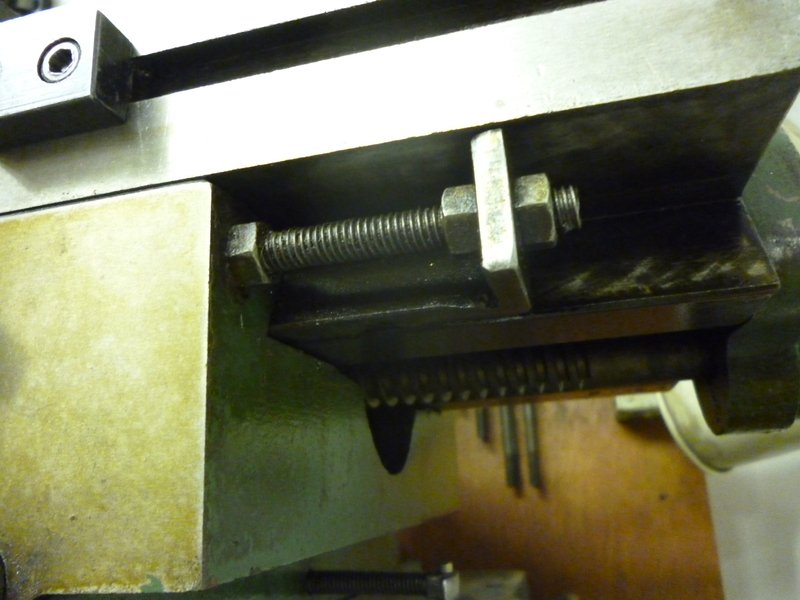 The vice with the workpiece is then rotated so that it is at an angle of about 1° off being at right angles to the milling table. The dovetail on the near side only is then cut completely. 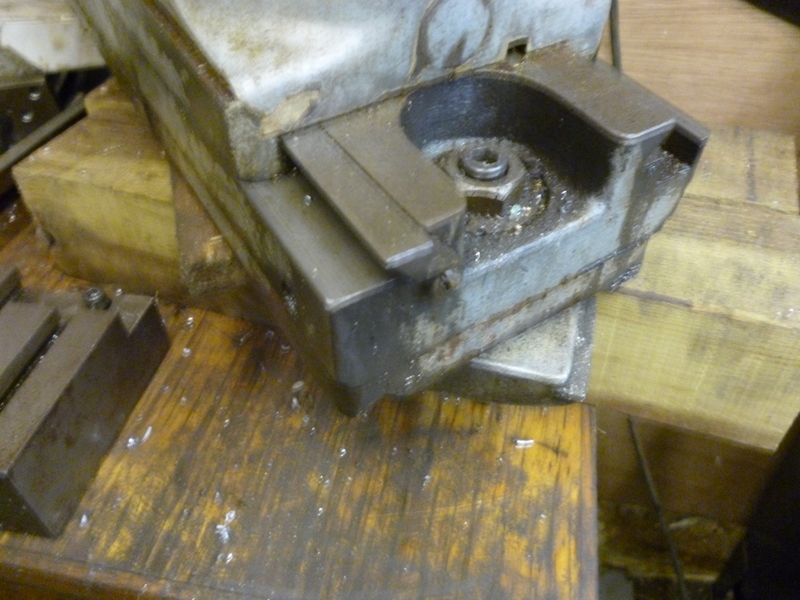 The female part is left in the vice and the vice is removed from the milling table. The tapered gib is then cut on one side only. This is about 50mm longer than the dovetail on the female part. The gib at this stage is much wider than the final part. This is so that it can held easily by clamping. The half made tapered gib is then clamped to the dovetail on the female part. This is done so it is aligned at the narrow end on the female part. Holes are drilled so that the tapered gib and the female dovetail can be screwed together. This is the tapping size. The two parts are separated. The female part is drilled to the clearance size. An additional hole is made in just the female part for a locking screw. The gib is tapped from the flat side all the way through. Both parts are deburred and thoroughly cleaned. They are now screwed together. 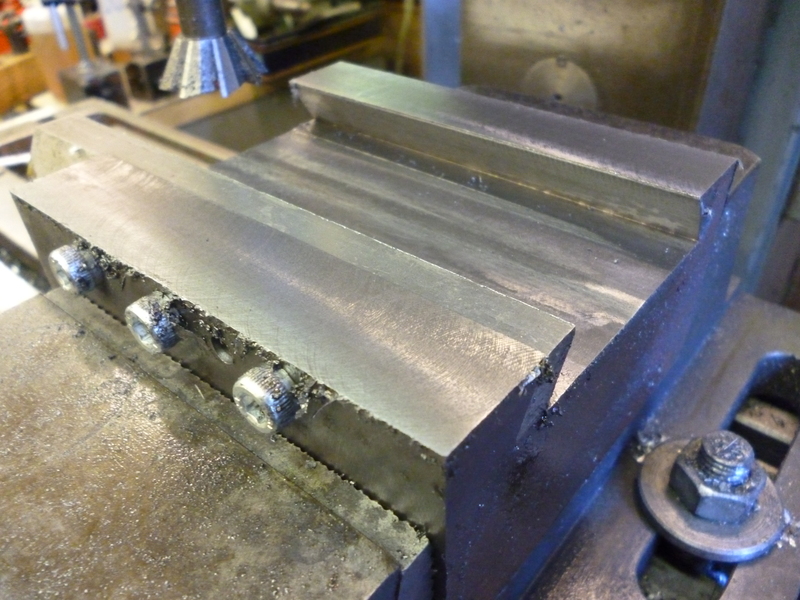 The rack vice is set square to the milling table. 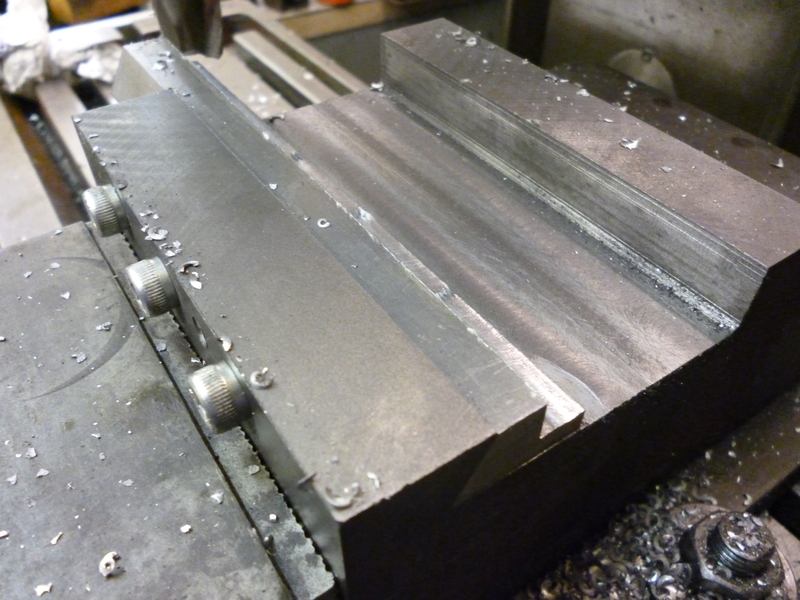 The gib is machined with an endmill to reduce its width. The whole length of the gib must be cut. It is important that where the gib is not supported by the female part that it is machined very gently with the sharpest possible cutter to reduce the risk of it being cut unequally. 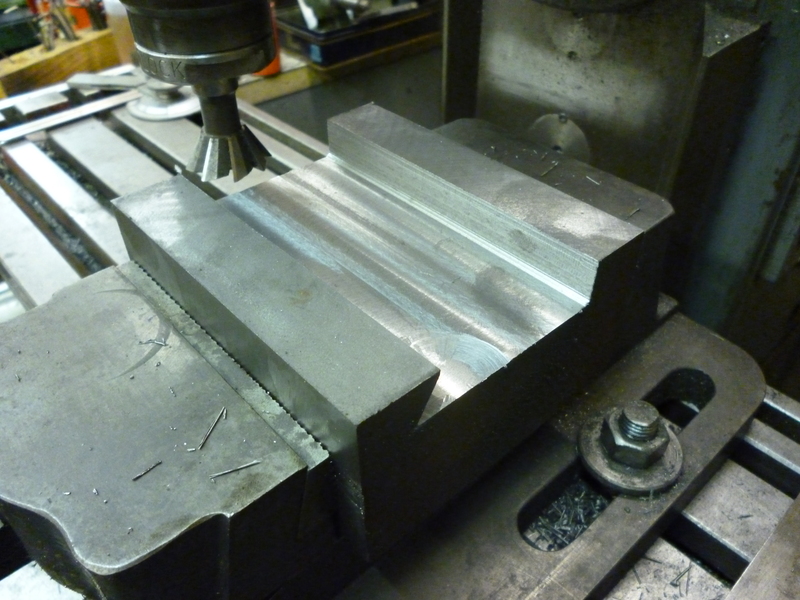 The tapered gib is very likely to be slightly distorted so the machined surfaces are not truly flat. This can be checked with a ruler in good condition. This might only be a few hundredths. Both sides must be ground by rubbing them on a piece of emery paper on a surface plate till they are flat. The might still not be perfect but the gib can be fitted. 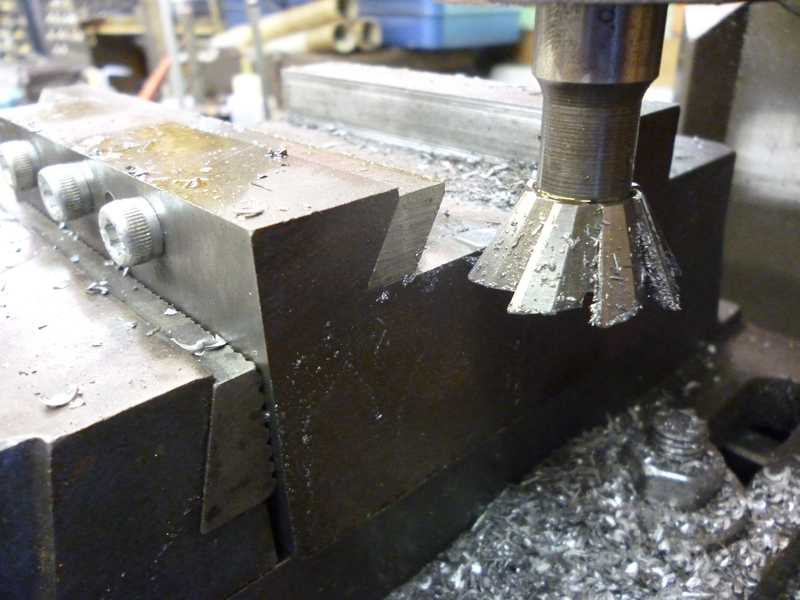 Without moving anything the dovetail cutter is used to just shave the surface of both flat parts of the female part. 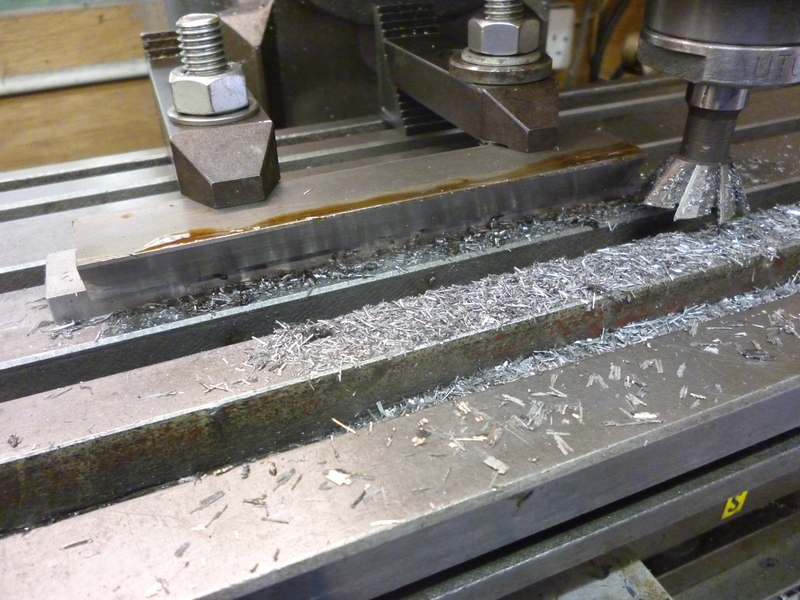 It is essential that the whole of both surfaces are cut at the same height setting. The gib is in a position so the gap is at its widest. The other side of the dovetail is cut in the other side of the female part. The reason for machining the male part first it that it can now be used to measure the dovetail on the female/gib part to the exact size. But since the gib is set to make the gap as big as possible it is still possible to reduce this gap by moving the gib. The aim here is to make the width only just wide enough to take the male part. 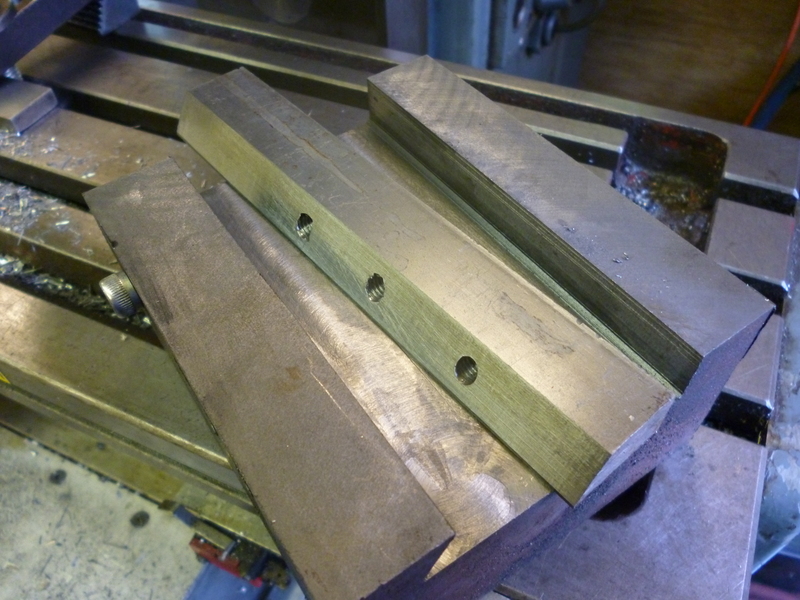 It is now possible the angles on the two tapered sides of the gib are not perfect. The gib has to be covered with a smear of blue and the male part tested against the other part. If there is a tight spot it has to be removed using emery paper. If the male part is too loose the gib can be moved to tighten things up. For the dovetail to work the gib must touch the male part equally wherever the male part is. A tapered gib is adjusted by moving the gib along the length of the dovetail. If it is too far out the dovetail is loose. If it is too far in the dovetail will jam solid. One method of adjusting is to have a screw that fits into the female part. This screw has a disk on it that fit a slot in the tapered gib. The gib is adjust by moving the gib in or out and then locked with a nut. It has to be locked so it cannot move either in or out. Suppose the female part of the dovetail is 100mm long. If the taper is 1mm in 100mm then if the taper moves in the female part 10mm the width will change by 0.1mm. A movement of 1mm will change the width by 0.01mm. There is a very important difference between dovetails using parallel gibs and those using tapered gibs. The first can easily be made without measuring anything very accurately. The second has to be accurate. It will be noticed that the depth is critical even though the bottom surface will not come in contact with anything. Fig. 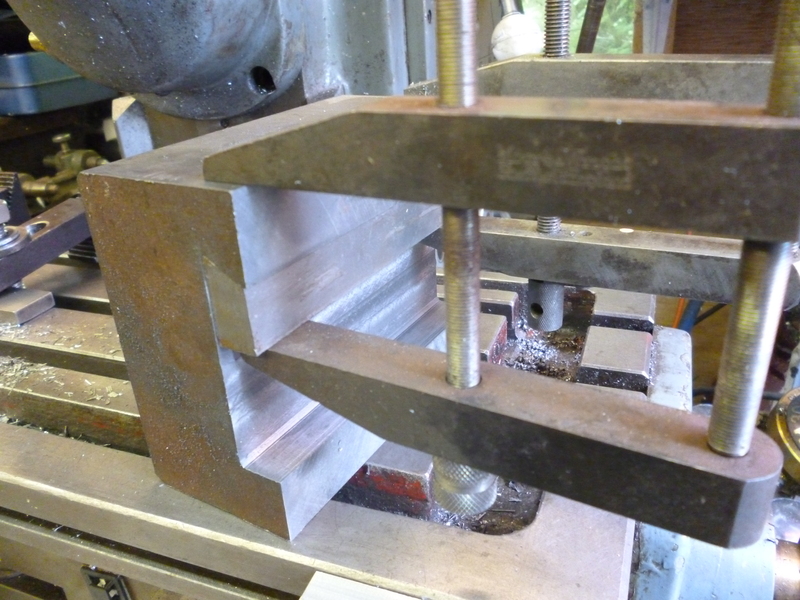 1023 shows how the missing bit of the width of the female part of the dovetail is determined. It might appear that measuring the gib is difficult. But the technique is completely different. The gib is measure directly at right angles to its two angled surfaces. Of course this should be slightly different at one end to the other. Hi thanks for sharing the project. Possible to drop me an email. Keen to ask more about the taper angles for small mills like Sherline.